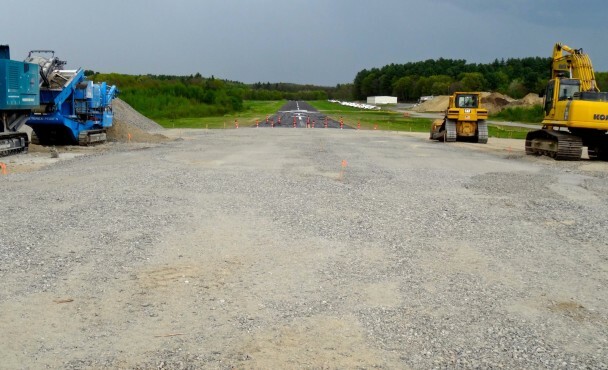 The airport will be closed to fixed wing aircraft during the final phase of the runway repaving project. Earth work is expected to be completed Saturday, May 30th. We will operate with a displaced threshold through Sunday, May 31st. We will be closed to fixed wing aircraft beginning Monday, June 1st. We anticipate reopening Saturday, June 13th. Join our mail list and watch for email ‘NOTAMS’ for any changes in this schedule. Watch FAA NOTAMs for updated field condition reports. “Best” Fuel Price – $4.29!!! Runway ‘3/21’ Phase II Repaving Project is well underway!!! The first phase (earth work) is expected to be completed by Saturday, May 23rd. We will continue operating with a displaced threshold through Memorial Day. During the Second (last) phase (fine grading, paving and marking) we will be closed to fixed wing aircraft. This phase is now expected to begin Tuesday, May 26th and last for two weeks. We anticipate reopening Saturday, June 6th. Watch ‘NOTAMS’ for any changes in this schedule. Nancy’s at the Air Field will be OPEN MEMORIAL DAY. Our next (third one) 10-unit T-Hangar now has five firm reservations. If you are considering the pleasures of your own T-Hangar unit, email DMcPherson@minutemanairfield.com for an information/reservation flyer NOW!! !